Use this Powerpoint Change Programme Roadmap Template to refine your programme plans into an inspirational story. This will save you time explaining long documents, and will help your team focus on the mission: Make your Change Programme a success! “Change Programmes” (part of Change Management) often bring tough leadership challenges. They also tend to be stressful for the people involved, who frequently misunderstand the purpose of the programme because they are not clearly informed. McKinsey believe that 70% of change programmes fail. Others disagree, or believe the measurement is misleading. The first step is to make sure you have a clear, easy-to-understand message. Great!… so how do we make the Change Programme “easy to understand”? Tell the story of your Change Programme on 1 simple page. Our Powerpoint Change Programme Roadmap Template can help you speed up the process, and lead you to a great looking presentation on ONE SIDE of paper. This saves you research time, and saves you Powerpoint editing time too! Yes – everyone loves a story, and your Change Programme has a story. You need to make sure it is SHORT & SIMPLE, so that ALL of your stakeholders and colleagues can understand, and take the story with them. This is the truth – it’s easier to write massive documents than it is to tell the story in a short, clear format. BE CAREFUL: If you cram in too much information, there will be no simple story for people to take home. The Powerpoint Change Programme Roadmap Template will step you through this process. Is my Change Programme Story clear enough? Do you understand my mission in 5 minutes or less? Then refine it, and test it again, until the message is slick and clear. Step 3: Roll it out! When people understand the story of your change programme, they can put their effort behind it, and can pass the message onto other colleagues. Cover Page – Version and context for stakeholders. What is the destination and target state? Try this inspirational approach yourself! 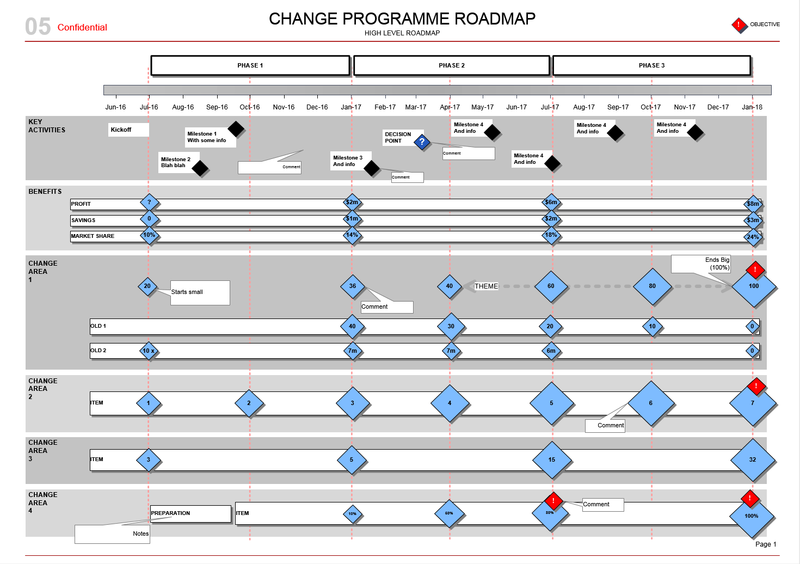 Use this Change Programme Roadmap Template to distil your programme into an inspirational story. This will save you time dragging everyone through your long documents, and will help them all focus on the mission: to make the Change Programme a success! Once you have created your Change Programme Roadmap, you can look further into some best practises for Leading Change. Kotter International offers this 8-step Process for Leading Change. Rating for Powerpoint Change Programme Roadmap Template Template: 4.9 out of 5 , based on 2 customer reviews. The Change Programme Roadmap shows clear transition, benefits, and objectives of your change programme. Map out your workstreams and KPIs – all on 1 sheet. The ultimate format to show your Cost Savings Plan: Arrange your projects on the Timeline, and describe the risk levels, KPIs, and Milestones. 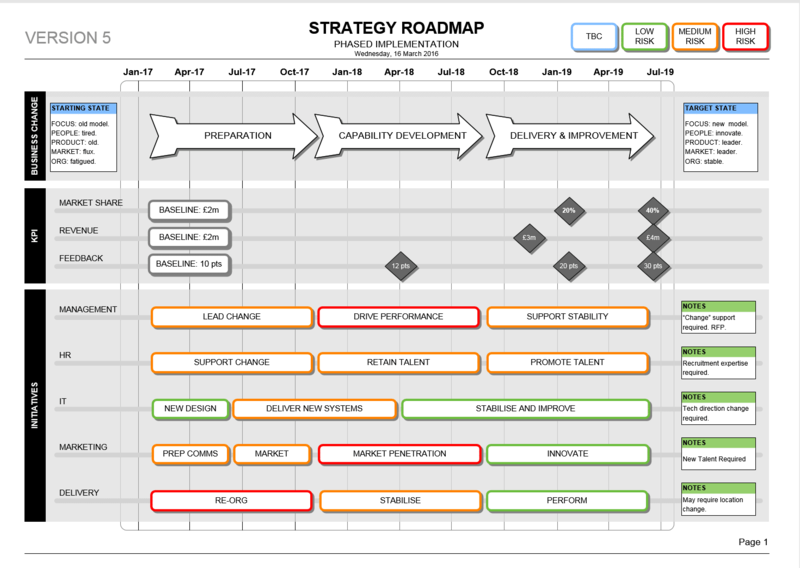 This Powerpoint Business Goal Deployment Roadmap template will enable you to quickly communicate your strategy. The simple format is easy to edit. This Strategy Delivery template shows your Plan, KPIs, Milestones & Project Goals clearly on 1 side of paper – Ideal for busy executives! The Visio Strategy Roadmap Template is the perfect Strategic Communication plan – Business Change, KPI, Initiatives, Timeline – all with a stylish design. Need to manage a large organisational change / Re-Org? This Transition Plan Template will show your “Change Plans” in a simple 1-sider for all stakeholders. This collection of professional templates will help you communicate your Re-Org, Org Change & Transition; Roadmaps, Transitions, Risk Management and more.